Home Costs > How Much Does Mobile Home Leveling Cost? How Much Does Mobile Home Leveling Cost? If your mobile home is unlevel, it is often due to the ground settling beneath the blocking and/or the foundation of the home. The soil, as it settles, can cause gaps between the foundation supports and the I-beams, leading to those unwanted cracks in the walls and/or preventing windows and doors from shutting properly. Over time, floors will also develop those annoy squeaking-like sounds, and if you leave your mobile home unattended, serious damages can occur so you will want to fix this issue as soon as you can. 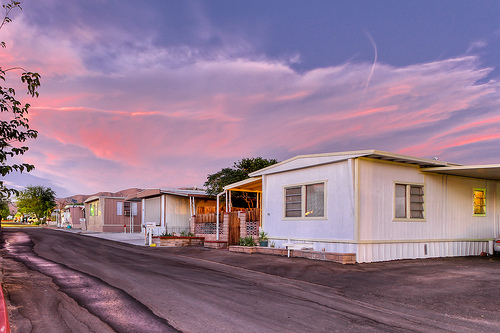 The costs of leveling a mobile home will vary depending on the contractor you hire, how it’s currently tied down to the foundation, the size of the mobile home, your geographical location and the issue at hand. From our research, for a simple mobile home leveling, it’s best to budget anywhere from $350 to $800 if hiring a professional. Since a lot of jobs can vary across the nation, we highly recommend you use HomeAdvisor.com to receive multiple quotes from local contractors for free. Here, you simply describe your job and licensed contractors will contact you with a free estimate/quote. On this MobileHomeUniversity.com forum thread, a member asked if $450 to $700 per unit, plus materials was a fair price. In turn, multiple members replied claiming the prices seemed fair and do not seem high; however, the foundation is either unsettled and/or wet, it could lead to a continuing problem, which would mean more time invested for the contractor. Others mentioned that as long as you’re either on rock or concrete and the ground doesn’t move, then relevel will never be necessary. Mobile Home Leveling and Foundation Repair, a contractor we found in Colorado, noted they charge anywhere from $450 to $550 for a single wide, $850 to $950 for a double wide and around $950 for a triple wide. To start, the contractor will first remove the skirting, if installed, from the mobile home to gain access to the piers which supports the home. Starting in the middle of the home, the contractor will use a level to check each pier to see how level the area is. Any piers which are unlevel will be marked. After all of the piers have been visually inspected and checked with a level, a mobile home jack will be centered beneath a pier to support the weight of the home. The I-beam will then be raised to the level of a water level mark by using a water level, and the home will be checked once again to ensure the entire home is level. The average job, from start to finish, for a basic job, should take about three hours to finish, and in most cases, it will require at least three people on the job site. What causes a mobile home to tilt? During the first year, the home may continue to settle, and as the ground reacts to the new loads, an uneven balance may occur. Organic debris in the ground, such as the soil sinking or a tree root rotting, may cause a void, causing the ground the basically slip. Any rainwater that is able to run beneath the home can wash away the soil around the piers supporting the home. When a mobile home is leveled initially, it isn’t designed to support any additional weight, but for many ignore this. Any attachments and/or site-built additions can bear more weight on the home, essentially causing stress to the foundation and piers. The doors and/or windows are hard to shut and do not shut as they did before. This can, oftentimes, include the cabinet doors and closets as well. You’re starting to notice cracks in the skirting, ceiling and/or walls that were never there before. The awnings or any attachments are bent or showing signs of stress. You can hear creaks as you walk along the floor. Visually able to see that the home looks unlevel from afar. Physically, you may be able to feel that the home is unlevel just by walking around.